A PROMISE OF GREAT THINGS TO COME IN 2012! Christmas was relaxing with all the family around which is just how I like it. I had the most fantastic surprise on Christmas morning as I opened one of my presents to find Santa had left me a dozen willow stems! Sounds a bit clichéd but it’s really just what I wanted, and with them came a book on how to create your own willow sculptures. I’ve always wanted to plant my own willow tunnel, and can’t wait to get started. 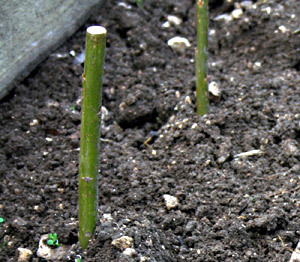 Willow stems in the cutting bed – Santa must have read my mind! In the mean time I’ve planted them in the cutting beds to get them started. I’m going to transplant them in the spring, as I’m not sure where I’m going to build the tunnel just yet. 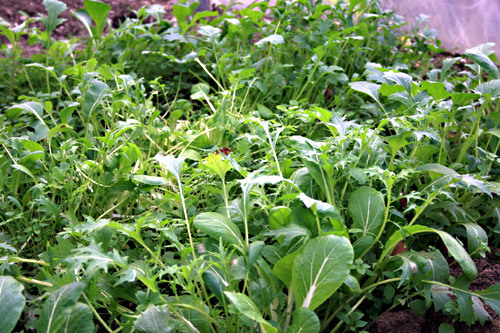 All this from a small packet of winter salad leaves sprinkled in the border of the polytunnel – Perfect accompaniment with a slice of home made quiche! We continue to harvest winter salad leaves from the polytunnel which are most welcome in the winter months, and the leeks and Swedes continue to provide us with vegetables. We did have some gorgeous sprouting broccoli over Christmas, but they’ve all gone now and so need to think about replacements. I’m thinking a few broad beans or maybe a few early potatoes. The wildlife pond we made last spring needs a good clean out. It’s full of leaves from a mature beech tree, which has shed its leaves all over the pond. 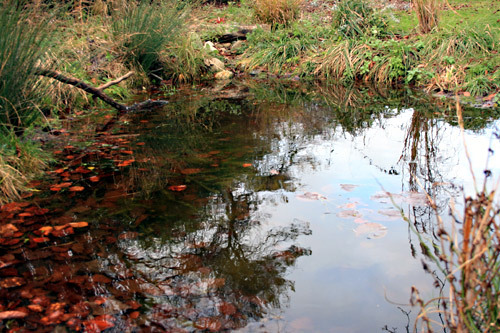 Rotting leaves are the worst things for a pond as they produce noxious gasses that can affect the wildlife, so best to wade in a remove as much as possible. 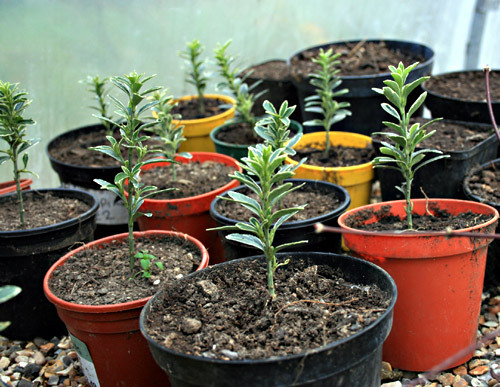 16 Cuttings from one plant – Works out to just 31 pence per plant ! I’ve been potting up some cuttings I took last September. 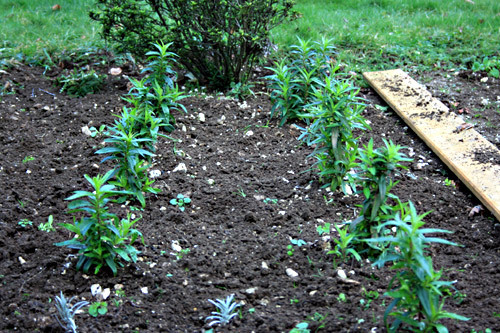 Along with the usual suspects I tried a few Euonymus Japonica cuttings, which took really well. From the one plant, which I paid £4.95 for in a sale, I managed to get another 16 cuttings, and pretty, much all of them have rooted. That’s approximately 31 pence per plant, now that’s what I call value for money. 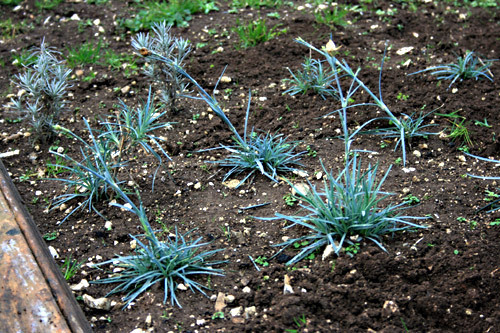 Last years carnation cuttings growing away in the cutting bed. The carnation and penstemon cuttings I took last spring are growing on nicely in the cutting beds. In late spring they will be lifted and planted into 5″ pots. I’m still hopeful I can get my back garden nursery business off the ground this year. Maybe I’ll start with a small car boot sale and see how it goes from there. Given the recent mild weather I thought I’d have a go at growing a few seeds in the polytunnel over the Christmas period. I always let a few sweet peas run to seed so I have stock for the following year, but I’ve never tried planting them before March. So I thought this year I’d give it a go, and the results so far have been encouraging. 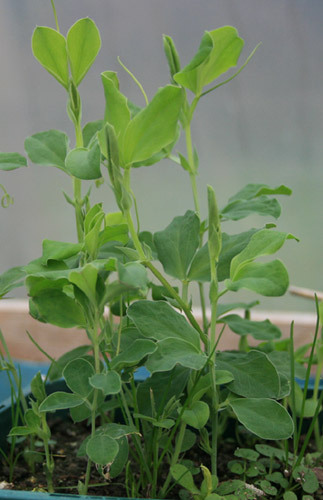 Winter sown sweet peas – Mixed variety harvested from last years seeds. The roots have filled their 3.5inch pot and they really need bigger pots. I’m hoping to have my solar panel installed soon to provide some heat in the polytunnel, but if the temperature drops I can always cover them with some fleece. I’ve also planted dwarf French beans in pots and broad beans in the border of the polytunnel. Not sure if they will survive but as I had the seeds left over from last year I thought I’d give them a try. Nothing ventured, nothing gained as they say.